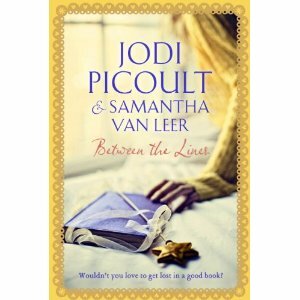 Samantha Van Leer is Jodi Picoult's daughter, and the idea for Between The Lines came from her. Jodi and Samantha developed the idea together, and have written the story jointly. It will be published in the UK on 5 July 2012 by Hodder and Stoughton. I'm a massive fan of Jodi Picoult's novels, devouring each one as they are published. I also read quite a lot of Young Adult fiction and was intrigued by the idea of this novel. Between The Lines is a very clever concept - a story within a story. Delilah is a modern-day American teenager, she's a bit awkward, she doesn't hang out with the cool crowd and she is obsessed with Oliver. Oliver is no ordinary boy, he's a character in a children's fairy story. He's just a line drawing, a figment of an author's imagination, but he is Delilah's dream man. She knows the story by heart, she knows every line and every illustration ..... until one day she notices that one of the pictures has changed ...... and then Oliver speaks to her! Combining fairy story with a modern coming-of-age tale this really is a very clever and unique novel. Yes, it is magic, but it also deals with real issues, those faced by teenage girls all over the world. Jodi Picoult's writing style is at the forefront throughout the story, peppered along the way with some real humour that at times is almost tongue-in-cheek. Oliver is desperate to get out of the fairy tale and Delilah is desperate for a friend. The fast paced plot follows their attempts to be together. Delilah has to deal with her Mother's increasing worries about her, how can she prove that she doesn't need to see a shrink, even though she's been caught talking to a book? Between The Lines is great fun and an ideal way for younger readers to sample Jodi Picoult's writing style. Samantha Van Leer has inherited her Mother's talent and I'm positive that this is the start of a very successful writing career for her. Her imagination combined with her humour are an ideal mix. Suspend all disbelief and enjoy this story for what it is, a magical fairy story with a cast of real-life characters. 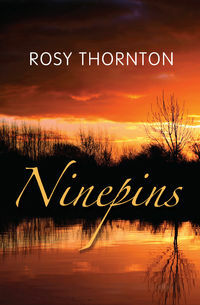 I was delighted to receive a review copy of Rosy Thornton's latest novel Ninepins - sent by Rosy herself. Rosy made a guest appearance on this blog last year, when I reviewed her last book The Tapestry of Love, you can read that review and Rosy's Q&A session here. 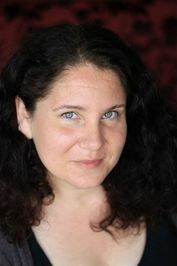 Ninepins was published on 19 April 2012 and is Rosy's fifth novel, and her first to be published by Sandstone Press. The story is set in the Cambridgeshire Fens, and the Ninepins of the title is home to single-mother Laura and her 12 year old daughter Beth. Laura and Beth have been alone since Beth's father Simon left when she was just a small baby. Laura earns a little extra income by renting out the pumphouse in her garden as student accommodation. Her latest tenant is 17 year old Willow, a care-leaver with something of a mysterious past. Rosy Thornton is expert at creating a real sense of place with her words, the vast and desolate, yet beautiful Fens of Cambridgeshire are brought to life in this story, the reader can almost feel the chill and the damp air when reading her description of the landscape. Descriptive scenery however, are not her only gift; her creation of three very different, yet extremely strong female characters is excellent. Laura, Beth and Willow; the adult, the teen and the child are the perfect cast of characters to play out what is often a fairly tense story. Beth's anguish as she starts secondary school and encounters the 'politics' of pre-pubescent girls is at times heart-breaking, and although it is well over 30 years since I experienced those feelings myself Rosy's writing really did bring some quite harsh memories back. Beth's internal battles with herself - whether to appear 'cool' to her new peers or to obey her mother Laura are so so real, as are Laura's feelings when she realises that her little girl is growing up and no longer is she the centre of her world. Add Willow, with her vulnerability covered by harsh words to this mix and Rosy Thornton has served up a novel with many themes. I enjoyed Ninepins very much, it is very different in style to The Tapestry of Love, showing the diversity of Rosy Thornton's writing ability. I wish her lots of luck with Ninepins and really hope that it gets the wide readership that it deserves. My thanks go to Rosy for sending me a copy of Ninepins for review. 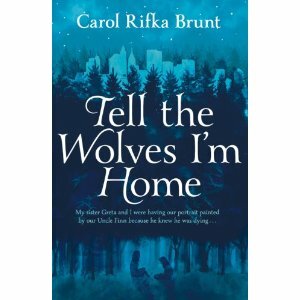 Tell The Wolves I'm Home by Carol Rifka Brunt will be published in June 2012 by MacMillan, after they were successful in winning a competitive five-way auction for it. This book is an extraordinary debut from a novelist who is skilled in her craft, her characters are created perfectly and leap from the page to take a part of your own life whilst you are reading. Junie Elbus, fourteen-years old and a little quirky, she could even be called a geek if you like. Nobody understands her except for her Uncle Finn. Uncle Finn, a talented artist, a man who treats Junie as if she were a queen, who takes her places, shows her new things and lets her be herself. Uncle Finn, who is dying of AIDS and wants his final gift to Junie to be an extra special portrait of her and her sister. It is not until Finn dies that Junie discovers that she wasn't in fact, the centre of his world. Junie discovers that Finn had a 'special friend', Toby, and that according to her Mom and Dad, Toby murdered Finn. Junie needs to know more and as she and Toby start their secret friendship she discovers more and more about her Uncle Finn, and also about herself and her family. Junie's older sister Greta has always been the successful sister, the actress, the singer. Junie knows however, that Greta's best piece of acting is the way she appears to others, underneath is a struggling, sad girl who hates herself and most things around her. Tell the Wolves I'm Home is a story of people, there is no fast-paced plot line, it is a gentle unpeeling of a family and it's secrets. Each character plays their own part with Junie and Finn at the centre. Yet the author never really 'meets' Finn, he dies almost before the story begins, yet it is his influence and his character that forms the rest of the novel. Gentle, beautiful, captivating and quite brlliant. I was really pleased to get an advance copy of One Breath Away by Heather Gudenkauf which will be published by MIRA in June 2012. I read her first novel The Weight of Silence about 18 months ago and really enjoyed it, so was looking forward to One Breath Away. The story takes place over just a few hours, in a small American town called Broken Branch and is told by the main characters involved. A man has entered Broken Branch School and he has a gun, he has taken a class of kids hostage - nobody knows who he is or what he wants. Using individual character's voices and stories to narrate is a very clever way of letting the reader know as much as possible about each of them whilst still concentrating on the main event of the plot. The chapters are, on the whole, short and to the point which I found really engaging, and made me want to carry on reading. Just as the reader discovers something about one character the narrative turns to another, leaving you wanting to know more and looking forward to the next instalment. I enjoyed this book very much, it's a quick read, yet very compelling. Each character voice was very lifelike, all had their issues and their flaws, yet all of them were likeable. It's more than just a 'school shooting' story though, there are many unresolved issues floating about and back stories that explain why each character reacts in the way that they do. The tension levels rise towards the end, as the gunman's identity and reasoning are unveiled, and there was no way I even came close to guessing who it was! 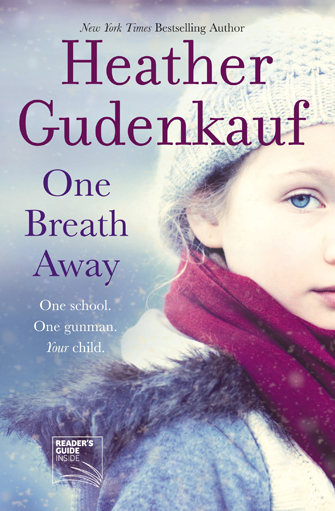 A great novel, I enjoyed it and look forward to reading more from Heather Gudenkauf. Who Won my copy of The Good Father by Diane Chamberlain? I am delighted to announce that the winner of my recent giveaway is Jan L.
Congratulations Jan, I will be posting your copy of Diane Chamberlain's The Good Father to you over the weekend. Thank you to everyone who entered, keep popping back to see me, I'm sure that there will be more goodies to give away very soon! I use Rafflecopter to randomly pick winners of my giveaways. 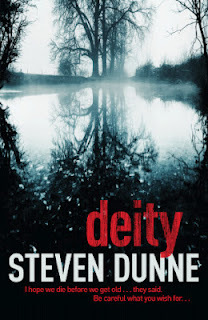 I have been absolutely gripped by Steven Dunne's third novel Deity for the past two days and even though I have not read the first two novels in this series featuring D I Damen Brook I was hooked from the opening paragraphs. Deity will be published in hardback by Headline on 26 April 2012, the paperback is released on 21 June. Set in the city of Derby and featuring the dark and brooding Detective Inspector Damen Brook, this is number three of a series, the follow-up to The Reaper and The Disciple. I'm really picky about crime novels, I want a clever plot with characters that are three-dimensional, realistic and intelligent, I want a plot that grips, that makes me lose track of time and that I don't work out for myself before the end. Deity delivers all of those things, and more, much much more. This is one of the cleverest, slickest and at times, terrifying stories that I've read for a long long time - a sick, twisted psychopathic serial killer matched by an intelligent, if somewhat flawed Detective. Damon Brook has a history which is referred to during the story, not having read the first two books in the series in no way spoils this one, the reader learns enough about Brook's past to understand his psyche, and to warm to him, and to forgive his straightforward, almost rude mannerisms. Brook is investigating two cases which on the face of it appear quite separate - a couple of murdered 'tramps' who are missing some vital organs and the disappearance of four local college students. As Brooks and his team delve deeper into each case, it becomes clear that they are linked, it also becomes clear that there is a dangerous, warped and extremely clever person behind the horrific crimes. With clever twists along the way, a couple of red herrings thrown in for good measure, some seriously scary detail and a cast of characters who jump from the page, this book ticks every ingredient for a perfect read. My mission now is to get out and buy copies of the first two in the series. Many many thanks go to Sam Eades from Headline for sending my copy for review. This is the second in the series by Quentin Bates featuring Sergeant Gunnhildur, otherwise known as Gunna, and is set in Iceland. The first book; Frozen Out was published in January 2011, you can read my review of it here. 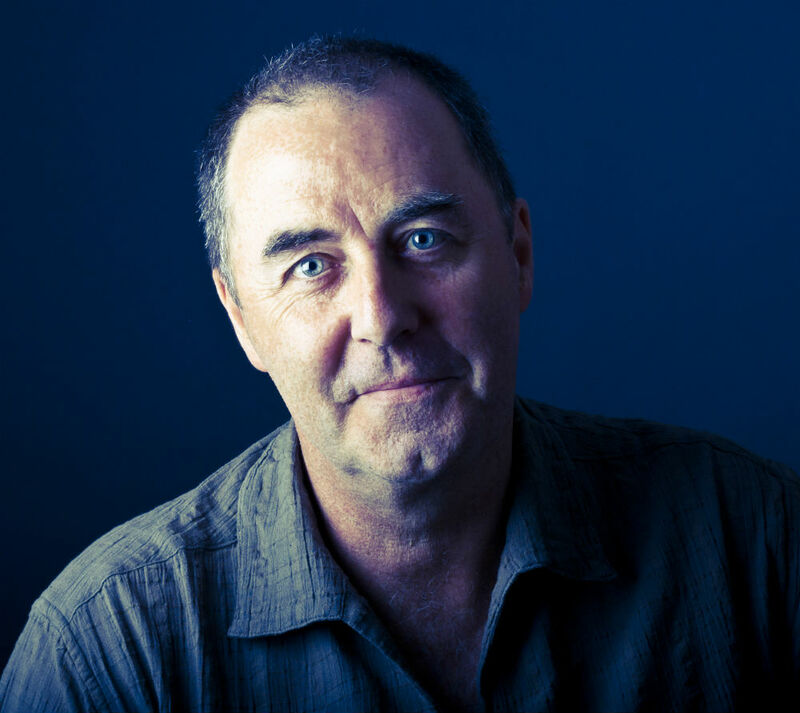 Cold Comfort was published by Constable Robinson in March of this year. Gunna has been promoted and is now working in the Serious Crime Unit in the capital city of Reykjavik, a big change from her previous posting in a small, slow-moving town. Gunna finds herself heading up two separate crime investigations, at least they seem to be pretty separate at first, but deeper investigation soon turns up quite a few links between the cases. The first case seems pretty straight forward; a prison inmate has escaped and is dealing out his own form of punishment to his old acquaintances. The second case is a murder - a C list celebrity who has been discovered murdered in her flat. As with Frozen Out, this is a well thought out story, with an intricate and well woven plot line. I enjoyed the twists and turns of the story, I enjoyed getting to know a little more about Gunna (although she's very close, and doesn't reveal much). Just one minor issue for me, as with the first novel, is the long Icelandic names of the characters. It's very easy to get them muddled up, many of them sound the same and look the same, and it was quite some time into the novel before I got to grips with just who is who. This certainly does not spoil the book at all. Gunna is a great heroine and the tantalising glimpses into her past history and her current private life certainly set the reader up for more to come in this series. I will certainly be following Gunna's next move and look forward to more in the series. As always, my thanks go to Emily from Constable Robinson for keeping me supplied with great reading material and forwarding my copy for this review.